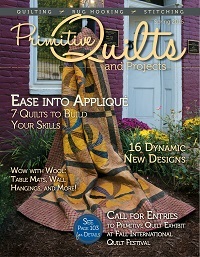 Primitive Quilts and Projects is the only magazine dedicated exclusively to primitive fiber arts. As a small family publication, we genuinely care about our customers and delivering a quality product. We're committed to providing readers with the most reliable industry information and in-demand patterns, as well as the quilting, rug hooking, and stitching projects they love to create. Using photography that's stunning in color and clarity, our projects are beautifully displayed to help readers easily select the projects they want to make. We also offer free projects, so be sure to check them out! Please sign up for our bi-weekly newsletter and follow us on all the social media channels. It's our way to keep you informed of industry news, the latest product updates, and opportunities to win great prizes. If you're looking for an authentic resource for reference materials, patterns, and merchandise to enhance your passion for stitching all things primitive, we're your go-to shopping destination!